Our mission for children at Shoreline Covenant Church is for each child to KNOW Jesus as their Savior. To GROW in faith and knowledge of God through the teaching of the Bible and age appropriate activities. To reach others by preparing and encouraging them to SERVE and share the message of His love. Our youth music ministry is resuming rehearsals in January 2019! Open to ages 5th grade – high school (“and beyond”), Called Out seeks to bring glory to God and hope to people through musical performance. Plus, we have a lot of fun! If you love to sing and/or play an instrument, or just want to see what it’s all about, join us for a rehearsal. We rehearse on Sundays after the worship service, approx. 11:30am-1:30pm. On Wednesday nights, 6:30-8pm during the school year, we offer Pioneer Clubs as a midweek club program for kids pre-K (age 4) through 6th grade. We have large and small group time, with Bible-based lessons, games, and fun. Every week is different, though we also feature each year favorite activities including pizza night, pine car derby, pajama movie night, and ice cream social. Children are welcome to join anytime during the year. Click the link above to learn more. Covenant Kids is a performing arts ministry for children, kindergarten-6th grade, that seeks to honor God through music and theater. 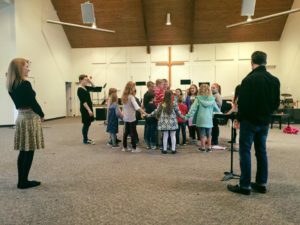 Covenant Kids rehearses on Sundays 11:45am-1pm, culminating in a Christmas play or musical in early December. Past performances (many of which were original compositions) include “The Avengers: Nativity Wars,” “Sara Sierra Saves Christmas,” and “A Charlie Brown Christmas.” Volunteers to assist with set design, costuming, and kid-wrangling are welcome! Rehearsals on Sundays, 11:45am-1pm (K-1st dismissed at 12:15pm). Thank you to our 60+ volunteers that made VBS 2018 an incredible week for over 70 kids in Shoreline! From the skits, decorations, and crafts, to the caring teachers, musical performances, and delicious food, it was a week to remember! This year’s theme was “Jesus is Our King.” We explored the kingdom to see how deeply God loves us, and how exciting it is to be loved by God, as we hear His parables. 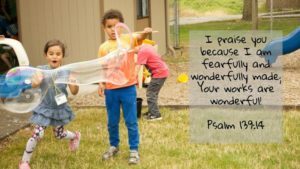 We experienced God’s tremendous power through Bible stories, skits, and music, and learned to open our heart to Him each day. If you missed it–or if you loved it–join us again next June! JAM’N is our Sunday morning kids’ time for kindergarten-6th grade, meeting during the adult Sunday School hour (Sept-May, 9-9:50am). JAM’N is an acronym for “Jesus and Me and…”–whomever you want to invite to join us as we read the Bible to discover what we believe, why we believe it, and how we should go about sharing the awesomeness of Jesus with others. JAM’N involves joyous, rocking music, art, drama, science, multimedia, Bible stories, praying together, puppets, and, of course, donuts! Offered for children, birth-age 5, during our Sunday School hour (Sept-May, 9-9:50) and our worship service (year-round, 10-11:15am). Our nurseries are staffed by caring and nurturing volunteers from our congregation (all of whom undergo background checks). Jr. Church is for kids, kindergarten-3rd grade, and offers age-appropriate Bible lessons during Sunday morning worship (year-round, 10-11:15am). Children attend the first part of the service with their families, and are invited to Jr. Church prior to the sermon. Parents then pick up their children in room 3 after the service concludes.